★UPGRADED VERSION. 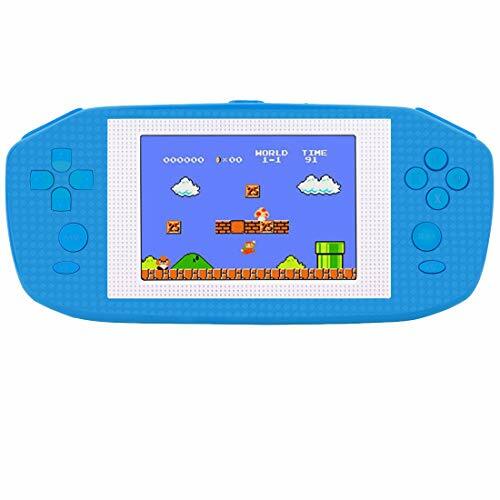 This iconic children's handheld game console has various advantages of different game player. It is both stylish and lightweight, only 110g. Therefore, it will surely bring full fun and surprise to its little master. ★PERFECT FOR PARENT-CHILD INTERACTION. The 416 classic nostalgia TV video games are all for the 80s and 90s representative games. Maybe you will be pleasantly surprised to find that nowadays children, the talent for playing games is so powerful. We are really not sure that we can go beyond them. ★ENLIGHTEN AND EXERCISE THE KIDS. The right amount of play so interesting and challenging games, can give the children a good relax in their spare time. More importantly, it can also exercise children's thinking and logical ability. In the game clearance success, it also can bring the children full of confidence. ★LATEST CHARGING METHOD DESIGN. Powered by lithium battery, 3 AAA batteries or USB, convenient and simple, eliminating many annoyances. ★WORTH HAVING. We will buy a variety of toys for children, but this gift will be very impressive and full of meaning. 100% satisfaction and zero hassle returns guaranteed. Please order now.